User opinion: No votes left yet. Cast your vote! Fortune Teller from Play'n GO is a slot game that probably mostly appeals to fans of slots with a mythical theme. The graphics are drawn with a lot of detail, but the music or sound effects leave a little to be desired. The special features of the game include wild substitutions, free spins and a bonus game. The variance of the game is medium, and you will probably have a few rounds without any winnings, but also the occasional smaller and larger win. The theoretical return to player is 94.17%, which is below average for a slot, as most games have over 96% nowadays. 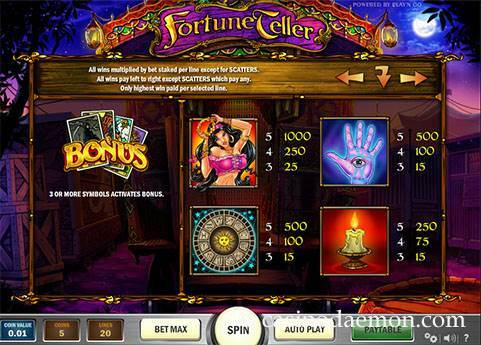 You can also play Fortune Teller mobile, and the game is supported on many different devices. The game has many special symbols and features, starting with the wild symbol showing the crystal ball that replaces other symbols for winning combinations and is also the symbol with the highest payout. The wild does not replace the scatter or bonus symbol. 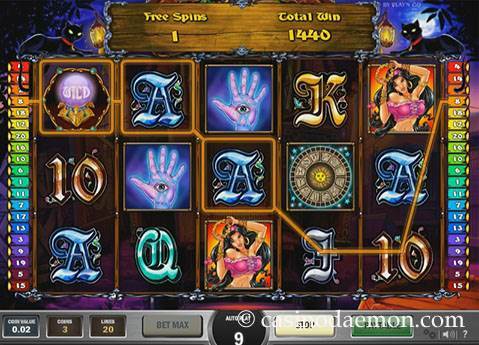 The scatter symbol with the black cat starts free spins with at least three of them anywhere on the screen. During the free spins the cat symbol turns into an additional wild. 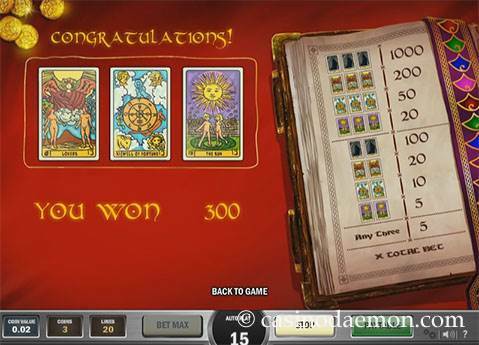 The bonus game starts with 3 tarot bonus symbols, and in this game you have to choose from a selection of tarot cards that reveal your fortune. 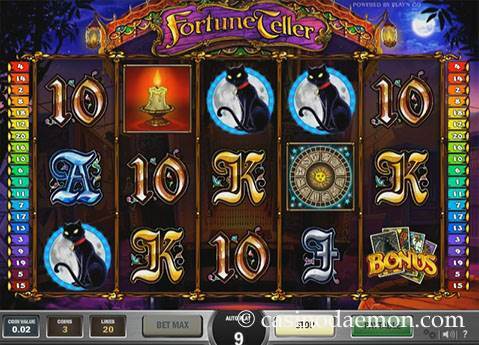 The Fortune Teller slot has 5 reels with up to 20 variable pay-lines. You can play the game with coin values of 0.01 up to 0.25 £/$/€, and you can play up to 5 coins per line. The minimum stake for all activated pay-lines is 0.20 £/$/€, and 25 £/$/€ is the maximum you can play in one spin. Automatic play options are also available.